Once again the evil Vampire Lord Dracula rises from his grave and it is again placed upon the Belmont family to destroy the dark lord. Every 100 years the Vampire lord rises to plunge the world into darkness under his control, growing stronger with each return. 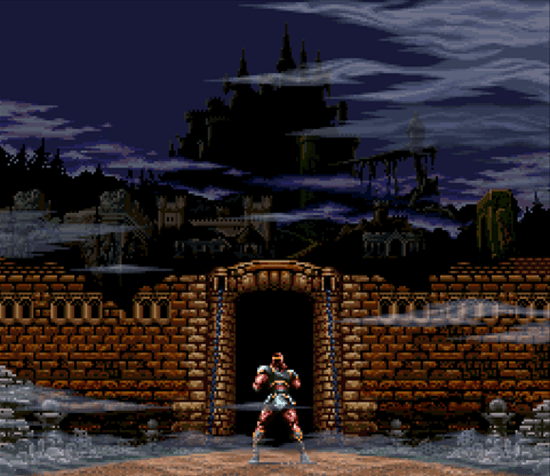 Simon Belmont, chosen by fate and armed with his trusty Mystical Whip descends into the Castle of the Undead to put a stop to the sinister plans Dracula has in store. Super Castlevania IV was originally marketed as a sequel to the first three Castlevania games on the NES however the game was more of a remake of the original game retelling the story of Simon Belmont’s first encounter with the Dark Lord. The vampire hunter Simon Belmont sets off on his mission to destroy Dracula, armed with his Mystical whip and an array of secondary weapons. Simons whip is an effective way of defeating the scores of monsters, undead and other nightmare creatures that you encounter along your journey. The whip can be snapped in eight different directions which allows the player to be able to combat the enemies coming for you at all different angles. By collecting an item known as the Morning Star the power and length of Simons whip can be increased by two levels. Another effective and useful feature of the whip is the ability to use it as a means of transportation. Scattered throughout the 11 levels are special rings that Simon can latch onto and swing across gaps that are too wide to jump. Having this ability in the game allows the levels to be more diverse with multiple areas to reach and hidden secrets to find. Secondary weapons are hidden along Simon’s path and can be found in the game by destroying candles, walls, and rocks. Each time a secondary weapon is used it will consume a set amount of “hearts” which are dropped from enemies and candles. These weapons include a Watch that will stop most enemy actions and the Boomerang that slices across the screen to return to Simon’s hand. With the improved capabilities of the SNES over the NES Konami was able to create strong level designs across the 11 levels. These levels test the player’s skill with many a new encounter and new area to conquer. The first handful of levels are set outside the castles vicinity. Level 4’s trips, traps and falling floors can easily and quickly eat away at your chances of fulfilling your destiny. You first enter the castle at Level 6’s Haunted Hall. A memorable area of this level is jumping from swinging chandelier to chandelier while avoiding the scores of monsters. The Treasury is another fantastic level with beautiful mounds of gold under foot, undead spirits and coffins which come alive to end your mission to destroy evil. An amazing and absorbing aspect of the game is the soundtrack. With an array of haunting melodies the music fits perfectly within the Gothic theme to the game. onsive and fluid however the controls do fail at times. An example is when edging Simon close to the limits of the platform it can result in different outcomes. On the odd occasion Simon will fall off the edge of a platform on one play through but on the next stand at that same spot and make the jump easily. A stand out aspect of the game is the enemies found throughout the varied levels. Whether you are being stalked by a Skeletal Knight, surprised by a leaping Merman or stuck in a pit of a Viper Swarm the game always keeps you on your toes and alert for the next encounter that is determined to bring you to Deaths doorstep. Super Castlevania IV is an amazing satisfying game. With a variety in the level design, different and unique enemies, a beautiful soundtrack and secondary weapons to collect and master this game is a must play. If you love to play an adventure game that will test you patience at times but leaves you with a rewarding sense of completion as you conquer level after level Super Castlevania IV will not disappoint. Do not miss out on playing this fantastic foray into evils lair. Next ArticleAVCon 2015 - We're back and we've got a lot to share with you all!